Amidst the turmoil in the newspaper publishing market there is one big problem for journalists leaving the safe-ish harbour of their big name publications and starting to experiment out on their own (if you are still wondering why you should be doing this read this as to why your safe harbour aint safe). It’s distributing your blog to your readers. Talking about distribution seems kind of odd in a way. Kee-rist, this is the world wide web isn’t it? Surely there are no problems there? Well of course there are. The majority of the population rarely read blogs at all. Blogs aren’t exactly a core part of their reading habits. On commercial sites the volume of RSS-sourced subscriptions and even email-subscription page reads usually make up the minority of traffic (RSS is barely a rounding error) and the ever present big brother Google accounts for 75% of traffic. And of course Google readers are not ‘regular’ readers are they? They just happen to be doing a search where your blog came up. RSS news readers, while they are available in all sorts of flavours (dedicated desktop software apps and web based ones like Google News Reader), are still the province of the technorati or news junkies. The big hope for bloggers is of course the burgeoning electronic book reader market. With estimates that Amazon has sold about 1.5m Kindles so far and 6m new e-book readers expected to be sold in the US alone this year, e-book readers are fast becoming mainstream, but at this stage a lot of e-book readers seem just that: mainly for buying books (ignoring the Amazon hype that they sold more electronic books on Christmas Day than real ones – what exactly did anyone expect). We can all buy books in hardcopy – we obviously can’t get blogs that way. For bloggers the Kindle and Sony Reader were still relatively problematic as a distribution method because Amazon charged a subscription for you to subscribe to your favourite blog (imagine Dell charging you every time you downloaded a web page!) and required the blogger to sign up for the Kindle program for which Amazon generously gives you 30% of the revenue they earn. And Sony’s reader has only just gone wireless with the ‘Reader Daily Edition’ targeted at newspapers. Both the Sony and Kindle readers rely on an ongoing 3G connection which must be paid for somehow. The Sony PRS-900 unit (currently on back-order since they’ve sold out) for example is a minimum $15 per month. Of particular interest for would-be bloggers wondering how they are going to get distributed to a mainstream readership is an e-book which does not require you to sign up for some sort of subscription for wireless access (a notable issue at the moment given the number of competing e-readers emerging, many of which are unlikely to exist in 5 year’s time), and being able to make a blog available all the time on the device. The most interesting development in this regard is not the hardware e book devices at all but public domain sofware that is emerging that will enable you to keep your e-book (whatever it is) synchronized with the bloggers you wish to follow (usually via RSS). Finally, in following up on a concept that emerged way back in the mid 90s, you really can have a customised newspaper (for free) that is just as portable as your normal newspaper. This missing piece in the jigsaw that gets you your customised newspaper effortlessly on your ebook today is a piece of free public domain software called Calibre, which has already been downloaded 500,000 times. 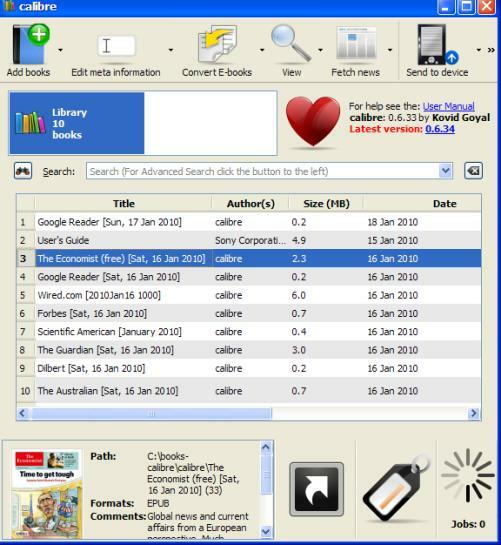 Calibre is cross platform – for example it supports both Sony and Kindle readers as well as others. As with podcasts, Calibre will automatically synch free RSS versions of blogs (as well as log-in versions of major publications like FT.com or the New York Times by supplying your username and password during configuration) with your e-book. All you have to do is plug in your e-book to the PC and Calibre squirts all the content across (and with the WiFi e-readers emerging like PlasticLogics it is likely you won’t even have to do that at some stage in the near future). While the new Plastic Logic e-book for example touts about 30 news sources Calibre out of the box already supports 400 mainstream news sources for free – in multiple languages at the time of writing with more being added every day. 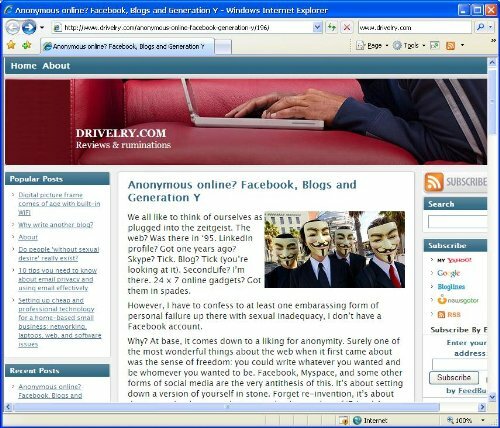 And it is simple to add an additional news source of your own like your favourite blogs just by telling it the location of that blog’s RSS feed. Then tell Calibre when you want to synchronise (once a day at 9am for example) and you’re done! You don’t have to wait: you can put together a customised newspaper template for yourself out of your favourite blogs today, and you can do it without paying a subscription charge with practically any e-book out there. 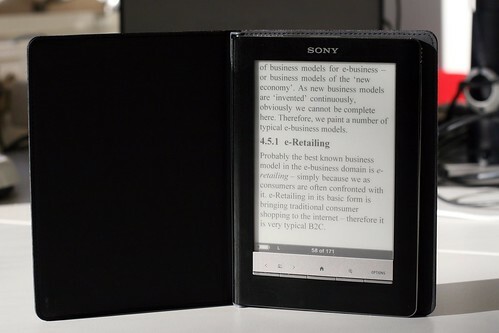 If your e-book reader is WiFi or 3G equipped then the hyperlinks that show up in the publications that you’re reading will be active, but if you’re using say a more basic e-book like my Sony PRS-505 you are still way ahead of the non-e-book world. PS If you use Calibre already (or after reading this article) you are reading publications where the ‘recipe’ has been written by Darko Miletic. To help him keep purchasing devices to test recipes on you can contribute here (Chip In below). One comment I would have after using a Sony e book for a while is the importance of display size. E books are particularly great for reading long A4 PDF documents (for example Annual Reports) that you would normally have to print out. However these docs can often contain tables that cannot be ‘re-flowed’ onscreen and still make sense. My feeling is therefore that I want a 10″ screen. When these are available I’ll buy one. Another comment relates to Calibre and 3G readers like the new iPad. With something like Calibre running your PC will spend a long time connected and sucking down content from the web. It doesn’t matter if you don’t actually read it because the data is effectively free with your home broadband connection.